Do you ever know something before you know it? Sometimes I find out that I know something I’ve never experienced before. I don’t realize this is so until I “learn” what it is–ostensibly for the “first” time. My first few months in Portland have been surprising in the sense that although I have moved to a much larger urban center than Moscow, some of my most meaningful experiences have been with the natural world all around me. The plants and flowers in the gardens I volunteer at, the fig trees growing along the edges of the sidewalks, huge evergreens in Alberta Park, the chickens and goats in my neighborhood, the way the rain falls hard and fast, the fantastic view from my living room I have of the sunset, and the fantastic view I can have from my bedroom window of the stars or crescent moon rising just before dawn are all experiences that have captured my imagination and helped me feel–strangely–at home. Sometimes it’s because of a plant I used to grow in my own garden, but often it’s something completely new–like green figs–that seems familiar but in a brand new way. Maybe not the best for rats, squirrels, raccoons or ducks in the hood, but still, I think I would have posted this under “wow” rather than crime and safety. Just because, well, it’s wild, literally. Just thinking of this transports me to a state of wonder rather than fear. A day or so after it was posted I said to Romeo, this morning let’s go the way the coyotes went. I don’t know what I expected to find–I guess I just wanted to walk down the street where they had been and see if I could feel that they had been there. At one point before we turned to go east, there was the slightest ripple in the energy field that made me flash on them traveling toward water, toward the river. . .or perhaps just picking up the scent of water in the air. Fanciful as it might be, I treasured this flash of coyote “thought” flickering through my human consciousness. Yes, they had been here, where we often walk. If only I had been the one to see them cross the street! This isn’t the first time I’ve slept through wild animals walking past my house. In Moscow, not once, but twice I missed a young moose. The first time I was living on Asbury Street and dozing on the couch during my afternoon nap when a yearling walked right past the house (I later saw a video my neighbors took when it was around the block from us.) And when I lived on Van Buren Street a friend that came over to visit said she’d seen one sauntering down my street (which is a dead end, bordered by an undeveloped field) in the early morning as she was on her way to our mutual friend’s house up the hill. Again, I was sawing logs. This time, though, it seemed magical that I had slept while they silently crossed the busy street half a block from my place. I kept imagining what it must have looked like to see them heading up 12th Avenue past the house with the Kwan Yin statue, then the free library, then the black fig tree. I thought maybe I could try to draw it somehow. And when I did I got a double-edged surprise. First of all, it came out as a very loose dream-like kind of sketch. I couldn’t draw it from memory, as I’ve done with a few things, because I hadn’t seen them. So I drew them from the memory of trying to imagine seeing them. In this way they became ghostly, ephemeral, as you see in the sketch at the top of the post. While I was making this sketch I had the unavoidable impulse to use a layer of deep violet over most of the sketch that blurred and hid most of what I had originally drawn. 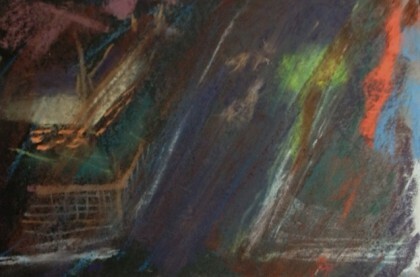 Only then did I very lightly layer back into the smeared cityscape glimpses of each coyote body in transit. I didn’t know why, but this somehow felt right. It’s utterly unlike anything else I’ve sketched in the last couple of years. Since I still spend a lot of my time negotiating new logistics like taking Romeo to a new vet, riding a new bus route, figuring out what’s needed to get a state ID, or doing any number of domestic chores I used to have help with back in Idaho, by evening I am often ready to sit back and just relax. Often that takes the form of watching an episode of NOVA or Nature on my computer. A few days after I finished this strange sketch, I noticed a Nature episode called “Meet the CoyWolf.” Tired as I was, I thought it meant “coy” was being used to describe wolves–which I found somewhat odd. But like the post about the coyote sighting, I could not get it out of my mind. Finally, tonight, I decided to watch it. Imagine my amazement to learn that “coy” wasn’t being used as an adjective to describe wolves at all. Instead it is the name of a “new” hybrid species resulting from Eastern Wolves mating with coyotes in Northern Canada near about a hundred years ago. They have longer legs and larger heads than regular coyotes, but are not quite as big as wolves. As a long, ongoing genetic biological study shows, they still coexist in the wild with coyotes and wolves in northern Canada where they first came into existence, but also have now migrated south and live in large numbers in the Toronto area and beyond. The episode also profiled studies of urban coyotes in Chicago and New York. This hybrid species is thriving and spreading ( a google search seemed to indicate they may also be out west in Oregon now, too)–and its impressive how smart, silent and adaptable these cosmopolitan canids are. Unless people feed them, they have little inclination to even be seen by humans, let alone be aggressive toward them. And yet they can be feet away from us, and we don’t even know it. The routes they use to enlarge their territory often follow railroad tracks. This gave a whole new meaning to the train whistles I hear in the distance north and east of me, and which I associate now with Portland, just as once I associated the fog horn with San Francisco. Now I’ll know when the whistles are silent, perhaps the coyotes are making their way along the open tracks. Perhaps that’s even where the two I missed were headed. Or maybe they were life long mates, traveling their territory together. In the days that followed the post catapulting my imagination into the realm of urban coyotes, several other people posted that they, too, had seen coyotes in different parts of North Portland, that there were lots of coyotes in the city. My drawing eerily invokes the same quality of light in the suburban Chicago streets filmed by the infrared night cameras in the Nature episode. The female they followed, though tracked with a radio collar, was hard to find and hard to keep following. She would step behind a tree silently just moments before a person and a dog walked by. They never knew. There’s something about this that satisfies me, thrills me even. Perhaps I should be wary of the dangers or the inherent nuisance or inconvenience, but to my way of seeing it we humans have been so savagely hard on wolves and so many other members of the animal kingdom that I can’t help but enjoy the fact that we’ve been outsmarted by these intelligent and ingeniously adaptive creatures. (They even help to control the rodent population in the bargain.) As I watched, I’d find a smile spreading involuntarily, yet again, across my face to know they live among us without us having a clue about it most of the time–like alternate universes that overlap–and only those who look at a certain moment see the two realities at once. Even the exceptional male who chose to be visible in a Toronto suburb, has eluded all trappers, and lives in mysteriously harmonious watch over “his” human neighborhood. It gives a whole new layer of meaning to coyote’s traditional status with Native American peoples as The Trickster. To be fair, if humans deliberately and continuously feed these animals, there is danger. In a wilderness area with a hiking trail up in Nova Scotia where humans continuously offered sandwiches or treats in order to get a better look or photo, eventually the coywolfs bit a couple of humans, and finally, tragically, even killed one. It’s the only documented kill of a human by a coywolf. They aren’t friend to sheep farmers in Canada either. One farmer who was interviewed had shot 50 that year. But he had no illusions about ever eliminating them. He said they were as smart, or often smarter than his border collies. They had learned to use the same positions the dogs use in the high grass. So he expects to have to look sharp and work with this new predator in his environment. But there is always danger, wherever and however we live. For me, it’s more a matter of our relationship to it. If we meet it with respect, rather than awash in fear about what could, or might, or even has happened, our whole world can change. That’s the creative challenge I try, however imperfectly, to live by. As in life, so in art. I never know when I sit down to sketch which way a drawing is going to go. I tell myself it’s all practice, and the point is to be in the zone of my imagination and let it take shape. 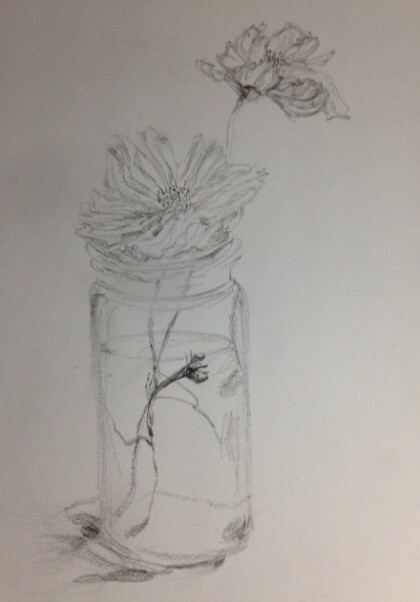 I can only draw a flower, for instance, if I try not to think of it as drawing a flower; otherwise I am locked in the fear of not getting it right. Instead I do my best to see it as a chance to let myself enter into the pattern of light, lines, density, shadow or color. When I do, if I’m lucky enough, evocative representation of a flower might emerge. I’m still in awe, though, that my imagination somehow knew, or paved the way for me to meet, the coywolf. I so love the fact that they are co-existing within our human created cityscapes, silently watching us, adapting to whatever we dish out. Making their way toward the river—or the open tracks leading to new territory–in my dreams of them, and in “real” life, at night, while I sleep. Maria, I just loved this post. Thank you for introducing us to the coywolf. I can see how they could come to inhabit your imagination. This is so interesting. Your comments about the dangers of people not treating wild animals as if they are wild resonates with me. We were in the Yosemite area a few weeks ago, and outside the park gates a bear was in a front yard, munching on apples. Everyone stopped to get pictures, of course, but there was one man who got out of his car with his camera and stolidly began walking closer… and closer… and closer… until he was within perhaps 15 yards. The bear got spooked and ran off into the woods, but it could have easily begun running the other way, meaning toward the man. Perhaps it’s because the only way most of us interact with wildlife is through television, the computer, movies and photographs, that we think wildlife is only there for us to photograph ourselves. Although most of the time interactions aren’t deadly, there is no reason to think that any wild animal won’t attack if they feel threatened–or hungry–and we should always respect them. Thanks, Danielle. I so agree–I suppose it’s often hard for us to respect this delicate balance because we are, most of us, so out of balance with nature these days. Perhaps we will come to learn. I always hope we will. This is a wonderful post, Maria! I love the drawings. I also think that knowing the other “reality” exists is a treat. Sometimes you glimpse the majesty of something sneaking by a window, and wonder where she’s going, where she’s been, what she’s thinking. The story of the coywolf hiding to let the unsuspecting person and dog walk by makes me smile, too! I’ve been volunteering at a wildlife rehabilitation center this year, and I’ve learned so much more about all the life that figures out how to live with humans, our destruction of their homes, our “well meaning” intentions… We definitely need to focus on respect (not fear) of these animals, instead of trying to get the best photo on Instagram. Teach people to love nature- and people take care of what they love. Thank you for these thoughts and the drawings. To me it is all such an enjoyable experience to realize we live among beings who seem so confident and comfortable as they pass through the areas we consider ‘ours’. It causes me to remember that this was originally and still is their home. We are the intruders. You re welcome, Carrie, and thank YOU for your eloquent comment so respectful of the animals we have displaced. I love this post, Maria. I had no idea about the coywolf, but I see this species as triumphant and crafty and altogether wonderful. I think that this is true of danger, and also of so many of the things we fear in life. It reminds me of what a dear friend once said to me, when I was telling him that life felt more uncertain than usual: “uncertainty is always all around us, Gena, whether we choose to make ourselves aware of it or not.” So too with danger, and I think your creative challenge is a wonderful response. Great insights Maria! Are coywolves a product of a scientific experiment? No Total Health Tips–they began breeding together on their own in one northern region in Canada. They still do cross breed there, and wolves and coyotes also breed among themsleves there too. A very unique situation.